Hi there! If you’re here from Thistlewood Farms, so glad you’re here! 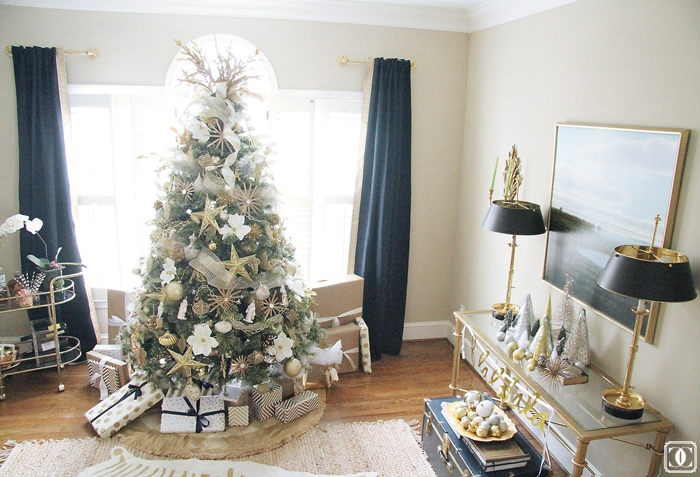 I’m so excited to share our home with you again through Lindsay’s Blogger Stylin’ Home Tours: Christmas Edition. Remember I shared my favorite room, then our Fall tour, then our Thanksgiving table earlier this year via BSHT? Secretly, I’ve been most excited for the Christmas tour because it truly is my most favorite time of the year, but if I’m being honest this was definitely the hardest one of all to pull off. 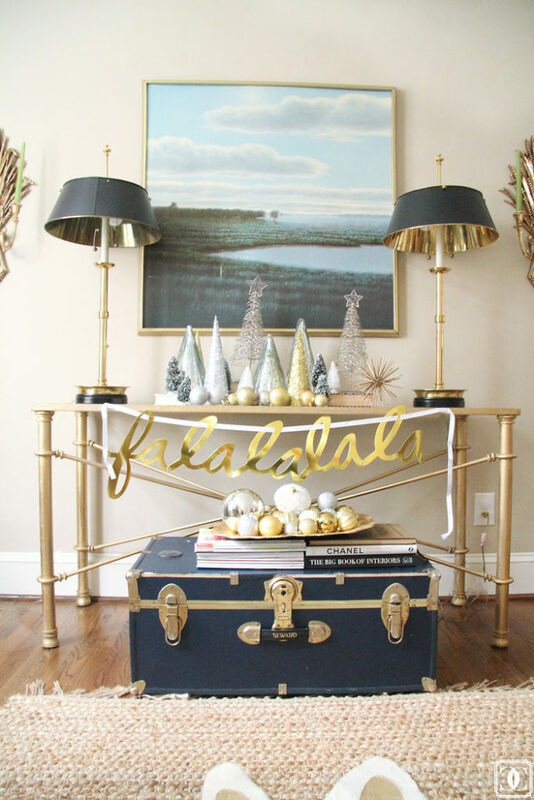 Unlike the other tours, I was feeling a little more traditional and ended up using bold color sparingly (which is clearly not my norm) and stuck with metallics throughout to tie it all together. Once it was all done though, it’s been so fun to enjoy with our little lady. 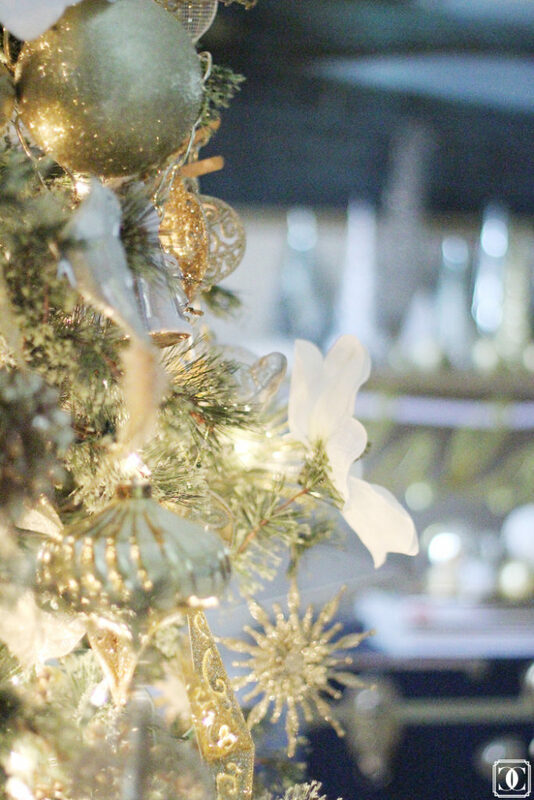 She loves the tree and looking at all of the ornaments and the reflection of the lights and sparkle in here eyes make my heart want to explode. 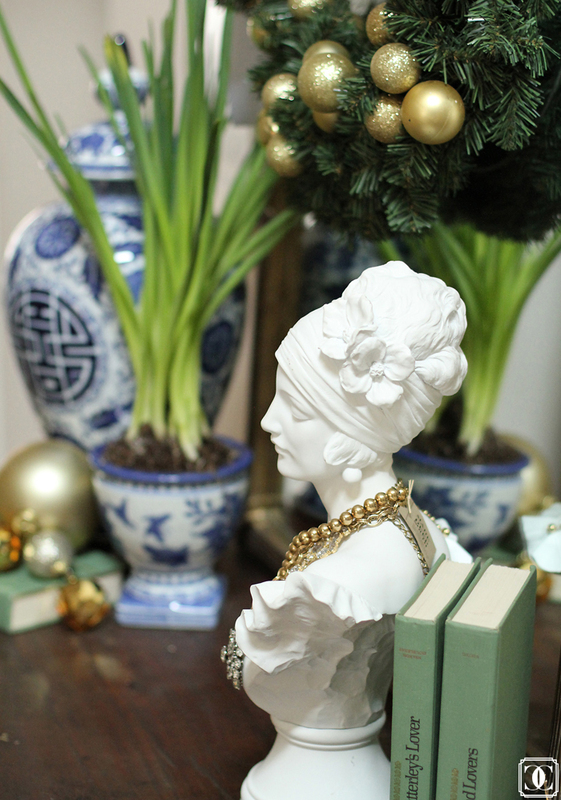 So here you go, take a tour through our decked halls…I hope that you enjoy! And if you want to see what our home looks like “normally” see our Home Tour here. 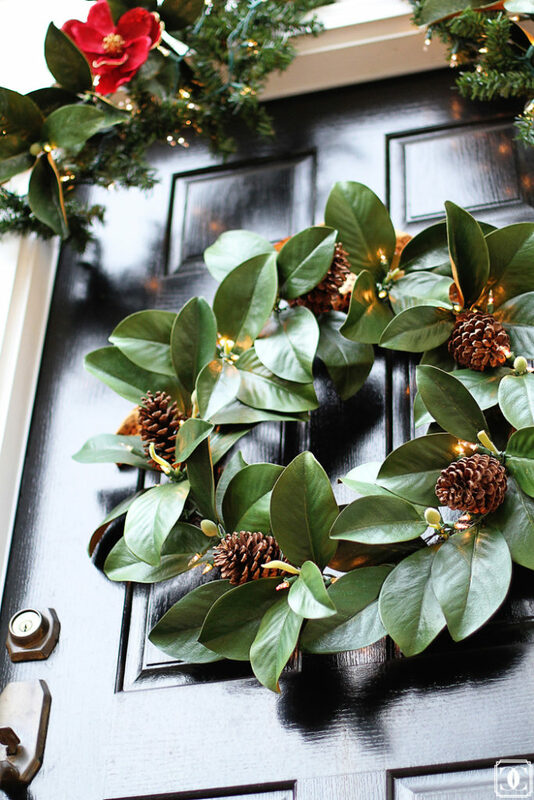 I went with a fairly simple front door and finally incorporated magnolia into our decor. 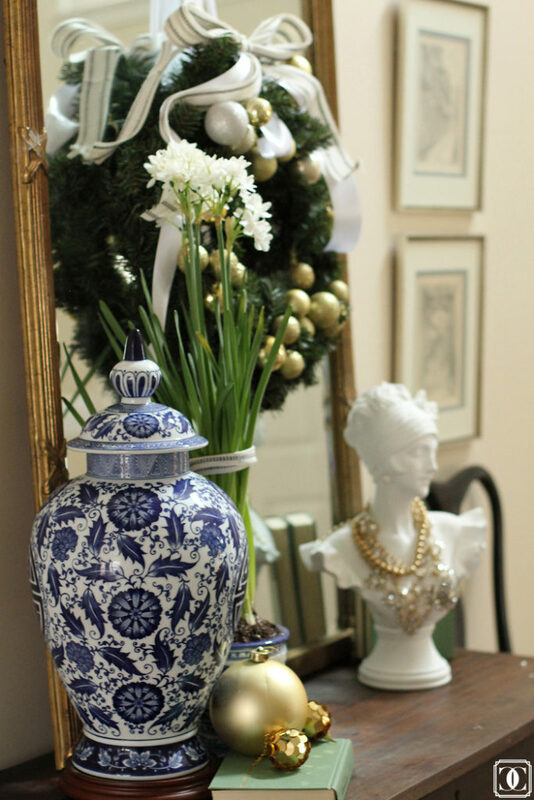 The entry came together at the last minute when I stumbled upon this huge ginger jar at Goodwill (and almost fainted). It brought in the little bit of color that I was missing, but is still a very traditional piece. Did I mention that paper whites are my absolute favorite. 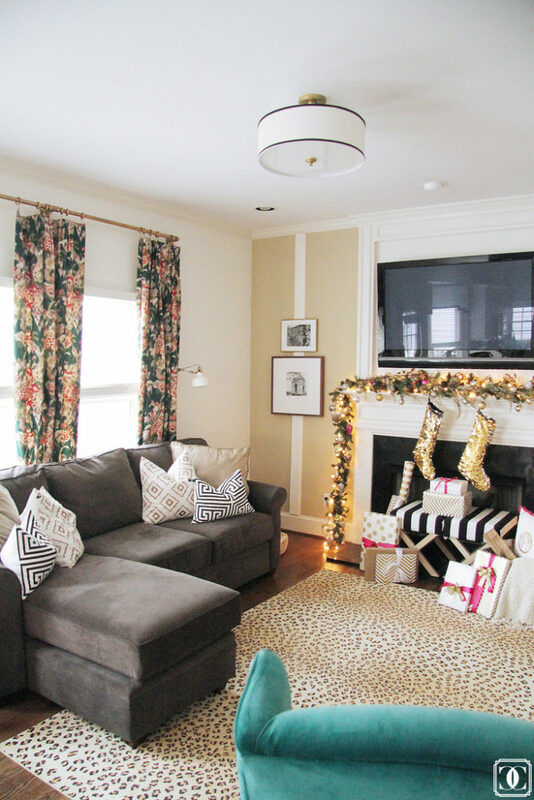 The family room is where I brought it a fun pop of color to accent the metallics. 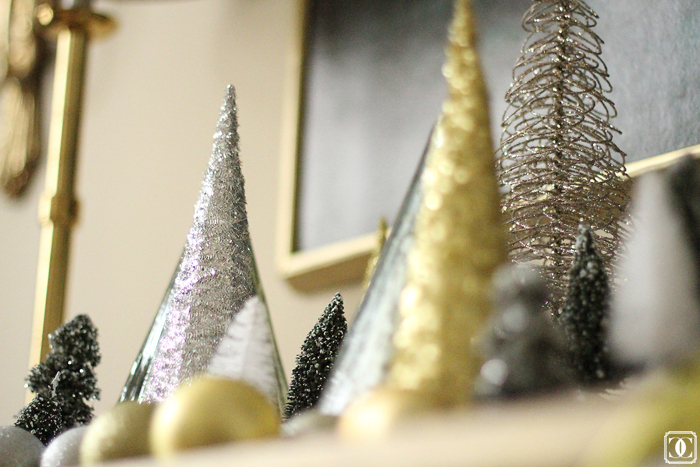 I found these sequin stockings at HomeGoods and cannot get over how much I love them. 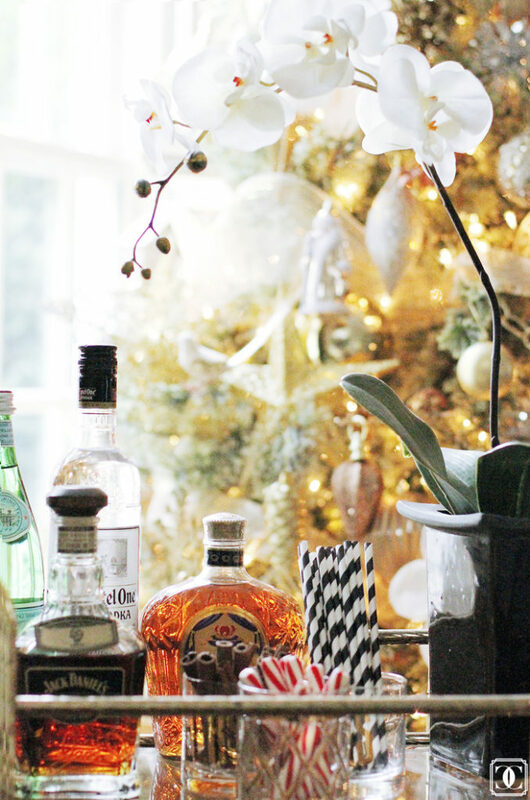 They are the most fun accent and I love how the reflect the garland lights. 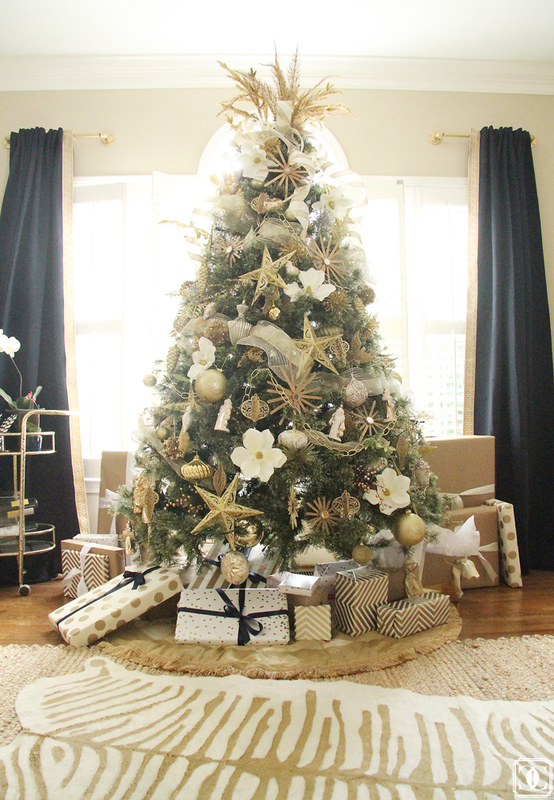 Our formal living room is where the tree lives and it completely lights up the entire front of our house. 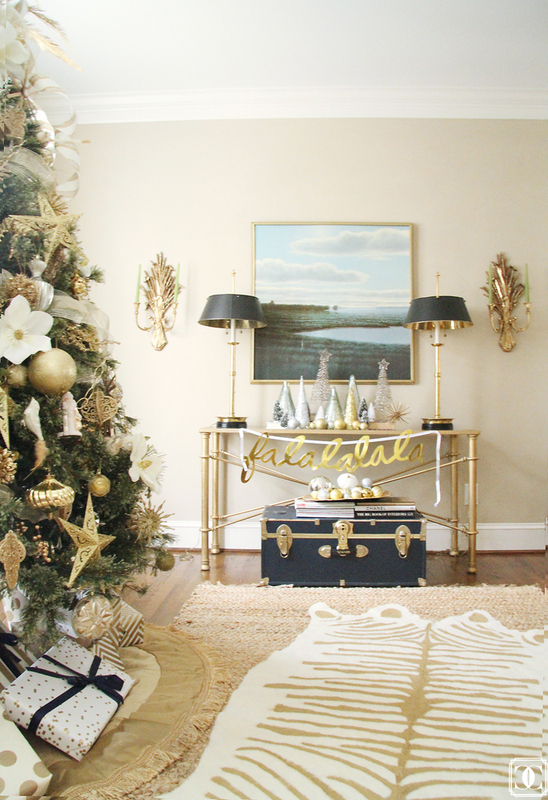 I went completely traditional here with neutrals and metallics and an unexpected pop of whimsy in the “fa la la” Oh Joy for Target banner. 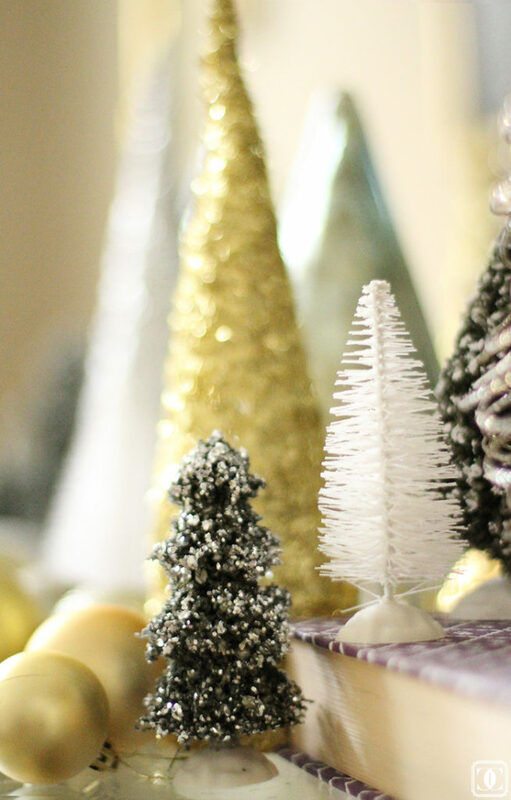 The tree is “frosted” aka not fully flocked, but I do love how it reflects the light. 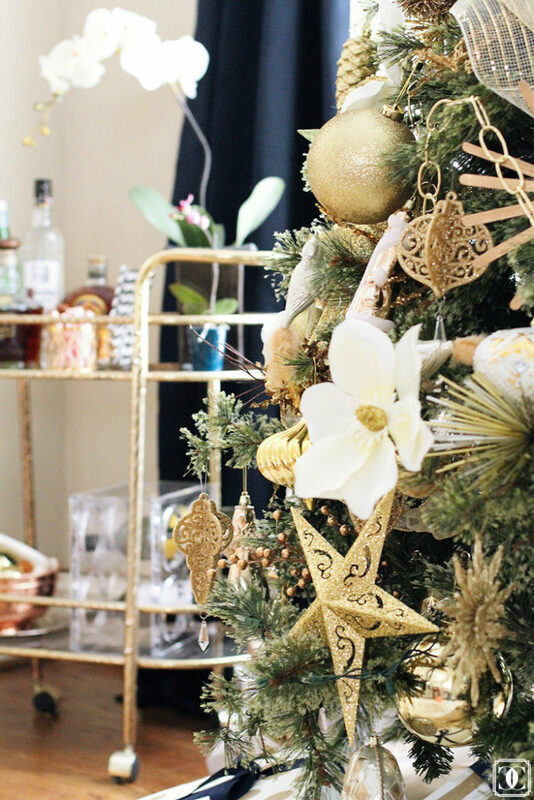 Honestly, the majority of our ornaments are from the Dollar Tree (the giant magnolias being my favorite newest addition) and I also added some brass chain that I bought by the foot at Home Depot. 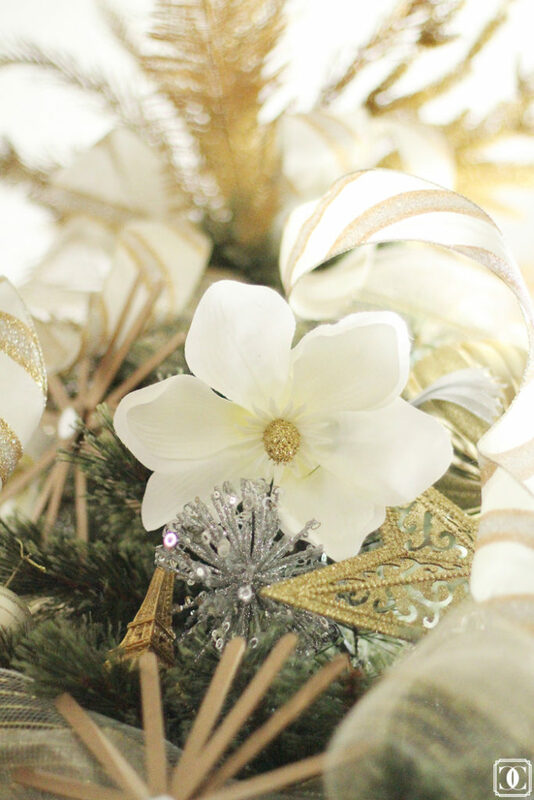 My favorite ornaments are still the sunburst DIYs that I did last year. See the tutorial here. DIY Faux Hide tutorial here. 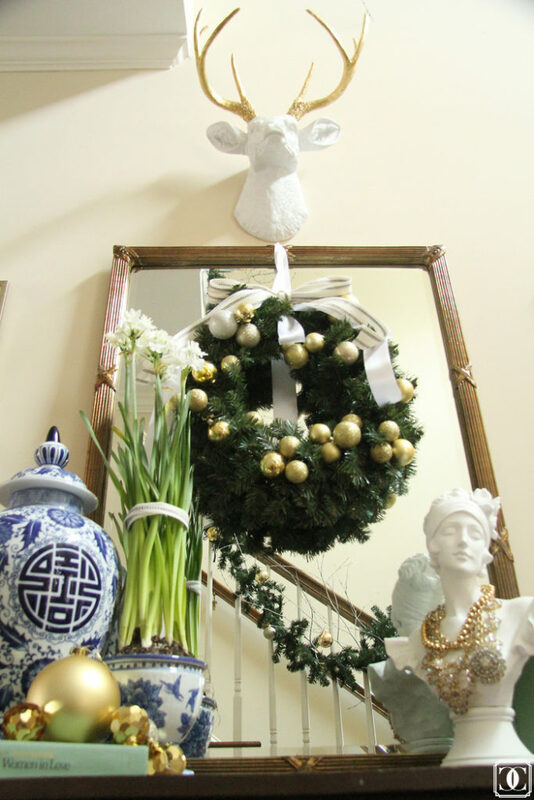 · The White Buffalo Styling Co.
Holiday Style Collab + A Fun Event! Just lovely! 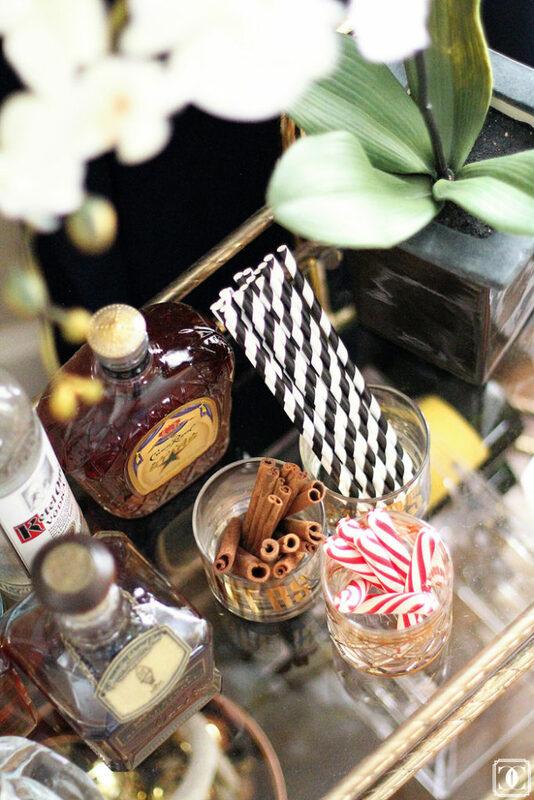 The peppermint sticks on the bar cart are a fun touch. It is just perfect Mallory! I love every little detail!!! Gorgeous as always!! Everything looks magazine ready! 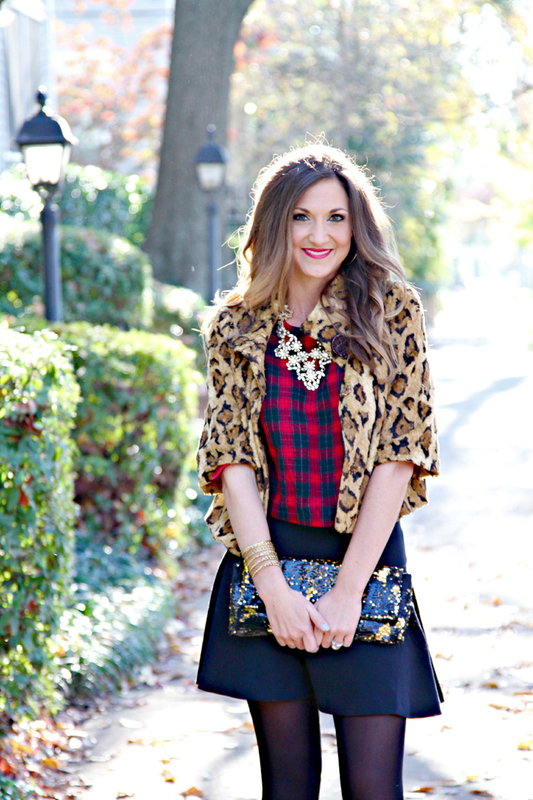 Wow – I just love it Mallory! Such a stunning home! So beautiful. 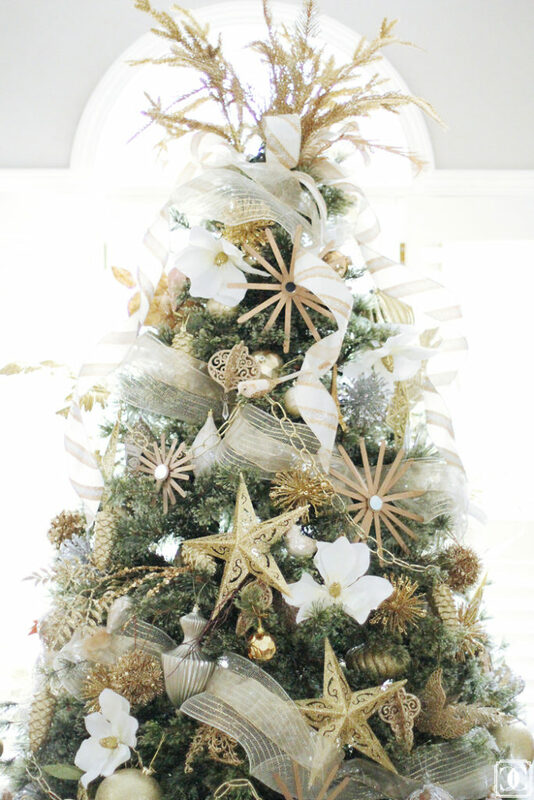 I love the hints of pink and of course all the glitzy gold. Perfect. your entry is STUNNING. i love love love it!!!! 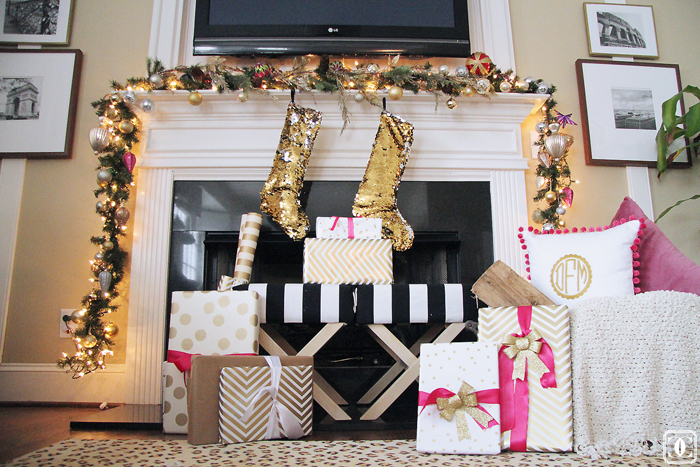 and hello gold stockings! everything is so you and so beautiful! Wow. Gorgeous. Right out of a magazine. 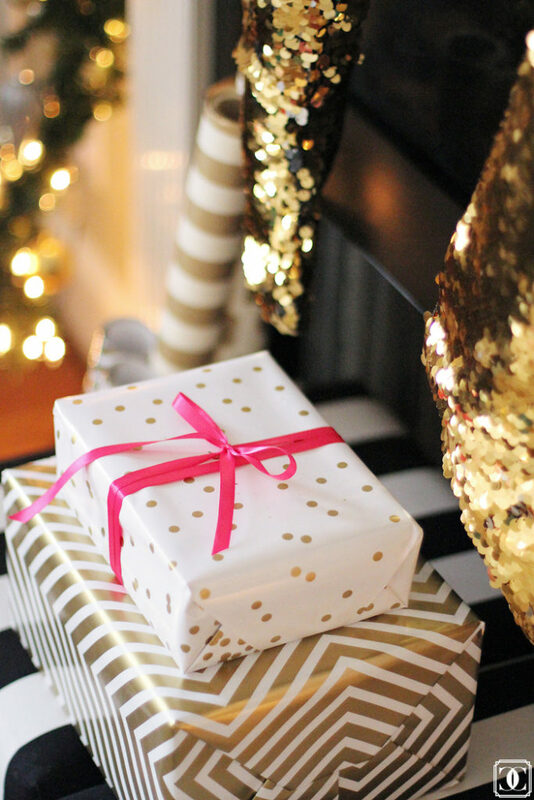 Where did you get the chevron and poka dot gift wrap? Love it! Such a gorgeous tour Mallory! Everything you touch is perfection! You're house is amazing! Seriously so beautiful, good job girl! 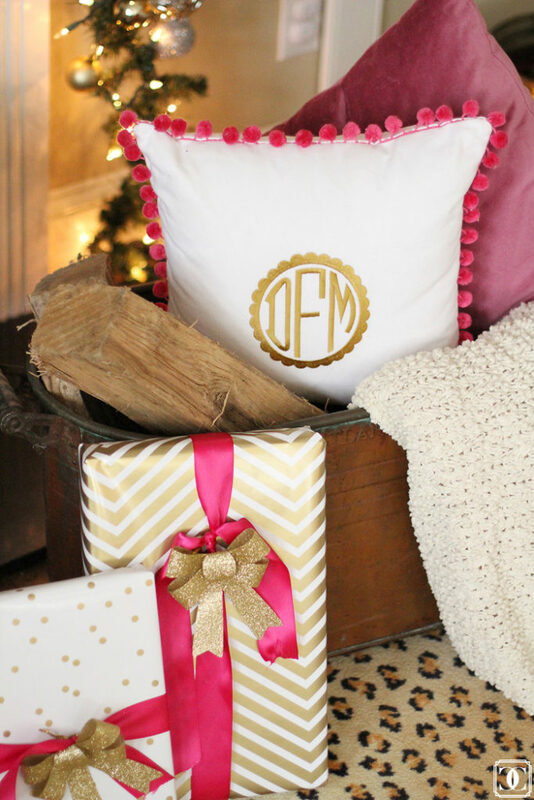 I love all your little pops of pink – the perfect amount of punch! Gorgeous, gorgeous, gorgeous! Just like you, my friend! I might tackle you for that Goodwill ginger jar. Seriously?! 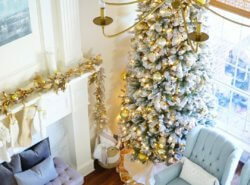 LOVE all the sparkle, what a fabulous home you've created for the holidays! 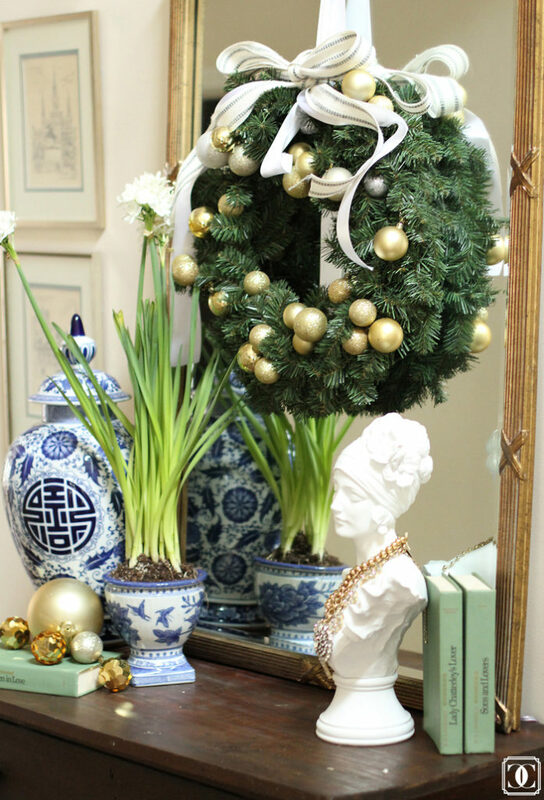 SO pretty – I love everything from the leopard print rug to the blue trunk to the mantel. Gorgeous! 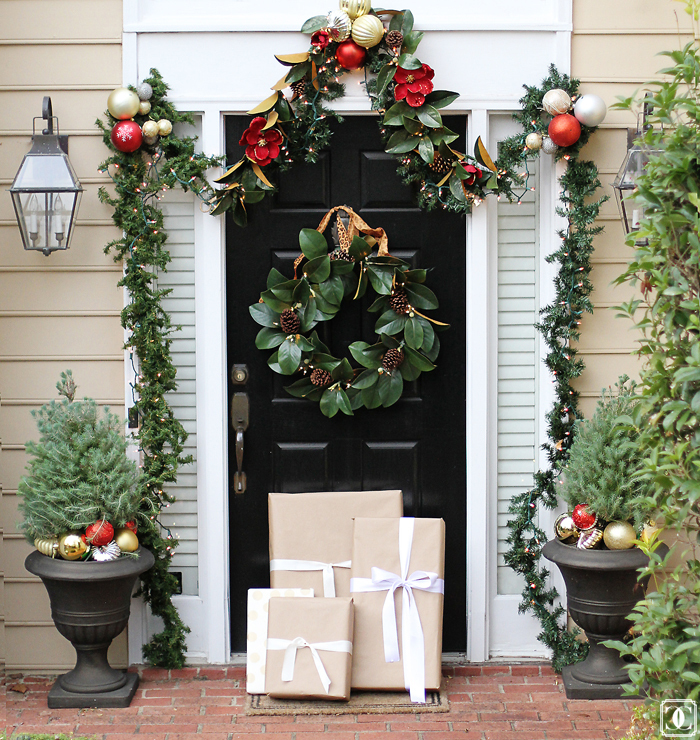 Fa la la la la – I love your house! 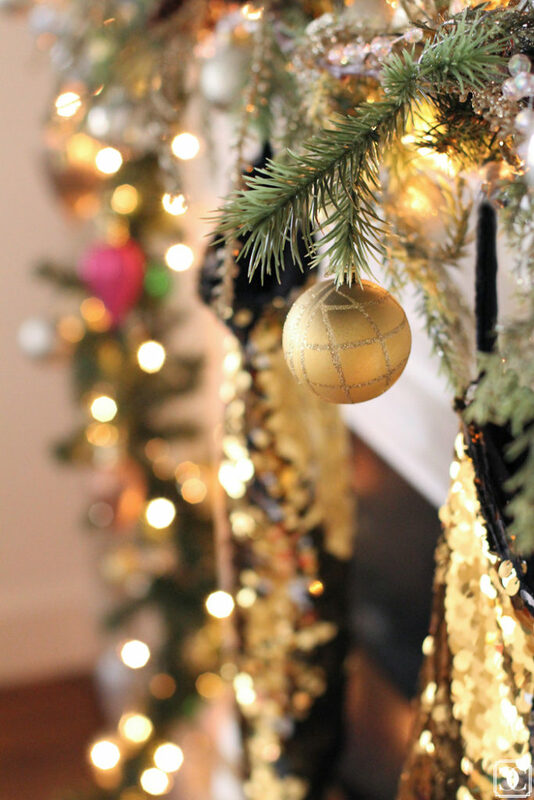 I am sad that I don't have sequined stockings in my life – hopefully Santa will put some under the tree for me and my life will be complete! 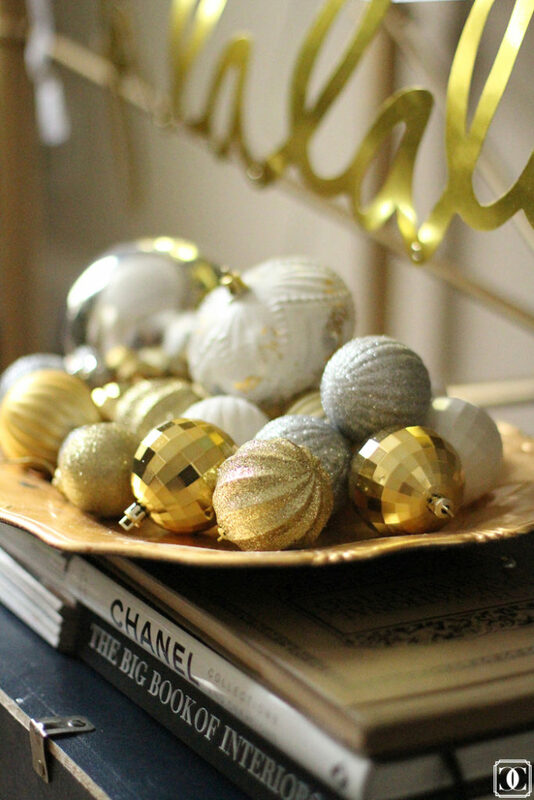 The gold and pink is so glam and fun! I am dying to get my hands on that falalala banner! You did a beautiful job!!! Love your home! So beautiful Mallory! 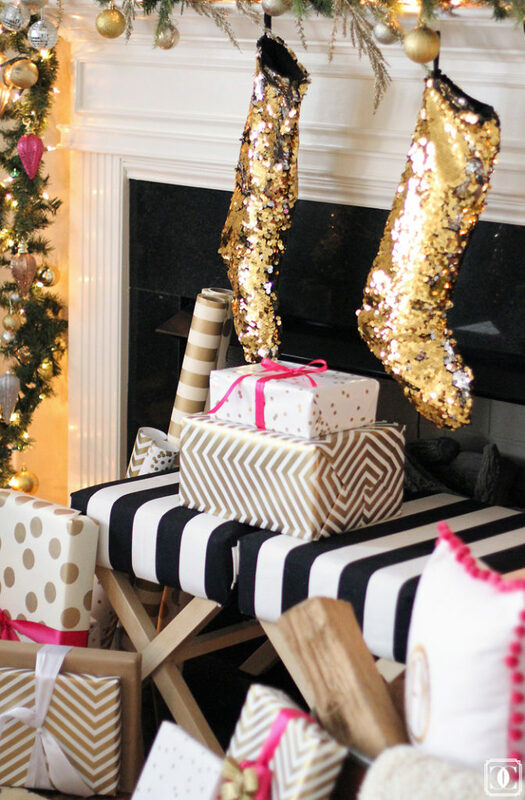 I love those gold stockings, I definitely would have scooped those up too! 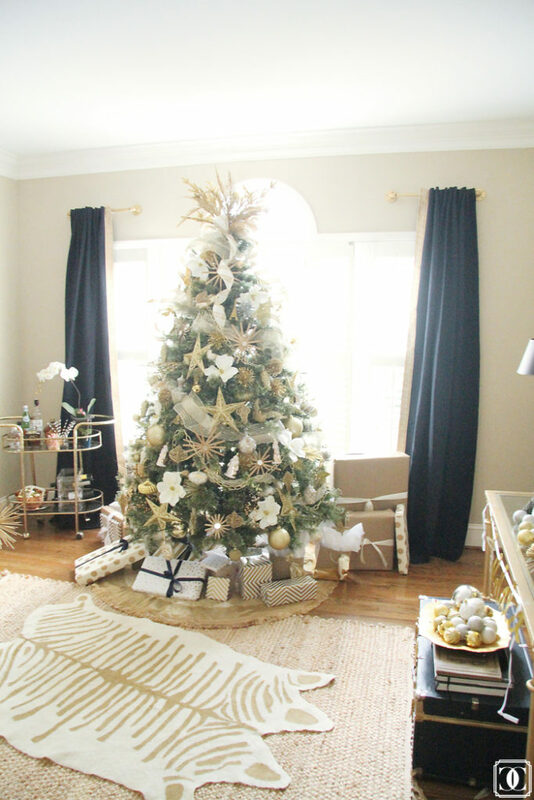 Mallory, your Christmas home is STUNNING! 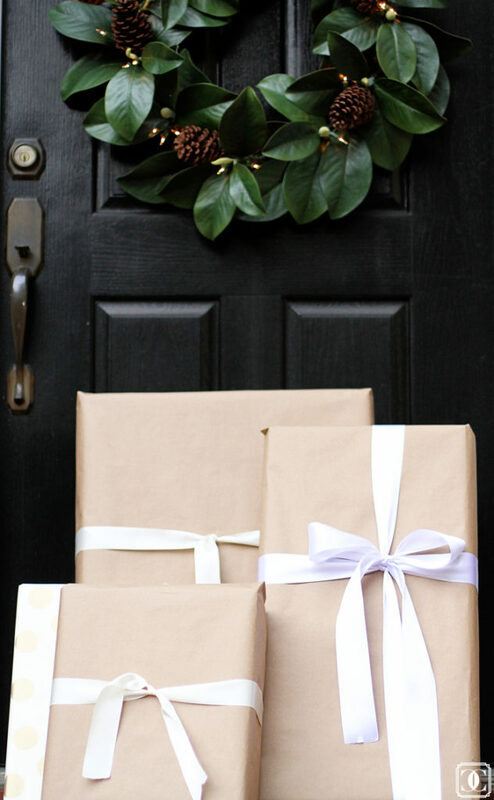 Your porch, your entry, your fireplace, your tree… I LOVE it all! There is not an ugly bit about it, but those stockings are aaaaaamaaaaazing! 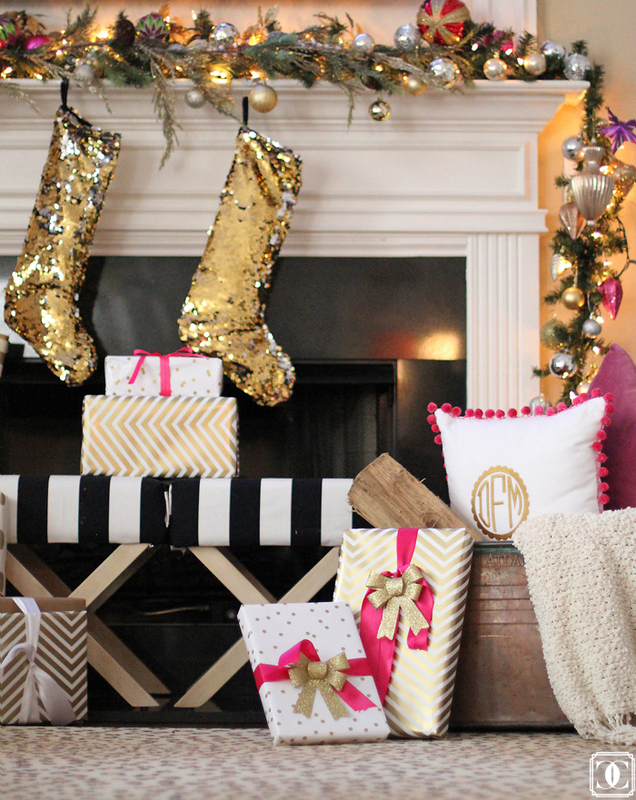 I heart those gold sequin stockings and your wrapping theme of pink, gold, and white is divine.